I received a comment the other day about the Uni-Ball Signo RT1 0.38mm and they asked if I was able to find them someplace other than JetPens.com. I hadn’t thought about it, but realized that aside from JetPens, they weren’t available in the US at big box retailers. HOWEVER. I was able to find the US equivalent: the Uni-Ball Signo Micro 207 0.38mm. It’s the exact same pen, only not as aesthetically pleasing. The ink is the same and so is the tip. I picked up a pack of four at Office Depot for a cool five dollars. If you are looking for the same performance and don’t really care about the look of the pen (I don’t really like it) it’s a great EDC addition. The JetPens version is a bit sturdier. The plastic isn’t as flimsy as the US release. The US version is clunky, made of thin plastic, and I don’t like the way the grip feels in my hand after a long session of note taking. But, like I said, if you are looking for the exact same performance, this is the pen. 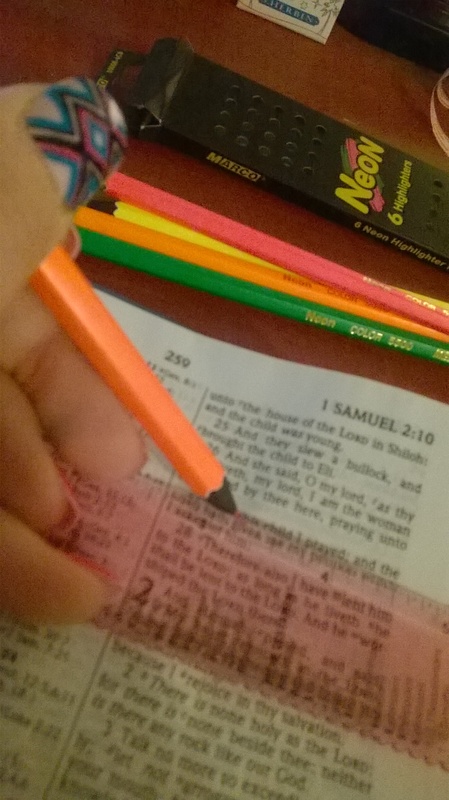 I use these pens for marking and note taking in my bible. I need a super fine tip that can mark small but is still legible and one that won’t bleed through the onion skin pages. The ink dries quickly, so even lefties will appreciate it. If you’re looking for a cheaper alternative to the JetPens RT1 or you just want it TODAY and not in a few, I suggest swinging by your local big box and picking up a pack (or two). Gel Highlighters: Is There an Ultimate? Since discovering the gel highlighter, I no longer use marker style highlighters for the majority of my note taking and studying. It makes sense for me due to the fact that most of my note taking and studying is in the bible and those onion skin pages can’t take a lot of marker ink before bleeding, smudging, and overpowering the print. Now that I have several sets of gel highlighters I wanted to try them all side by side and with different types of inks to ask one thing: Is there an ULTIMATE gel highlighter? Or is does it just boil down to preference? I used four pens: a UniBall ONYX, a Pilot Down Force ball point, a Pilot Kakuno fountain pen (with Noodlers Heart of Darkness ink), and not pictured is the Zebra Sarasa 3 gel pen. The top four highlighters I picked up from Dollar Tree and they came in two packs. These are the first gel highlighters I ever used, and to be honest, they are decent gels. For fifty cents a piece they really are top notch. Next, are the Monami Essenti Stick highlighters in “bright”. They also come in pastel, but I ordered bright because I wanted the color to grab my attention. I picked these up as singles from JetPens.com. I own the entire set of the Sharpie Gel highlighters, but I couldn’t find the other four. So, all we are working with here is orange. The final set is the Accu-Gel Bible Hi-Glider in pastel colors. I picked these up as singles from Mardel Christian Bookstore. If I’m being honest, I’ll tell you that I am primarily using the green one right now during my studies. Not that it’s “better”, but the tip is smaller and the type size I’m reading right now is itty bitty. Let’s see how they perform! First up is the Monami Essenti stick. They glide a bit roughly, but they really do go on dry. It only smudged the ball point ink from the Pilot Down Force, but I did go over the ink several times immediately after writing. 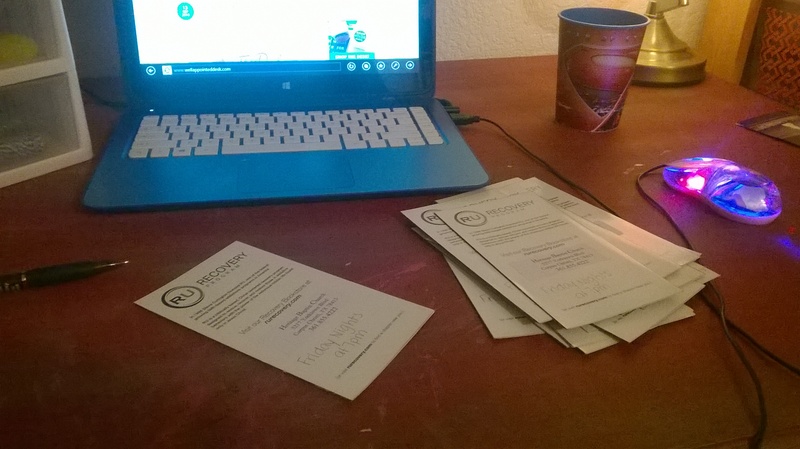 All samples are highlighted immediately after writing, but I only went over the ink once. This one I highlighted several times because I missed the wording. I have no motor skills, apparently. These gels are great for document highlighting and I use these a lot when I highlight in books. They are great on onionskin paper as well, but the tip is very large and round so it’s hard to use on tiny print. Dollar store gels: NO SMUDGING! Seriously, these gels didn’t smudge any ink. I told you. For dollar store office supplies they really are top notch. They do feel “wetter” than other gels, but they don’t smear or smudge when writing with them. The gel itself just feels softer. It doesn’t affect the way they highlight or the ink they’re put over. 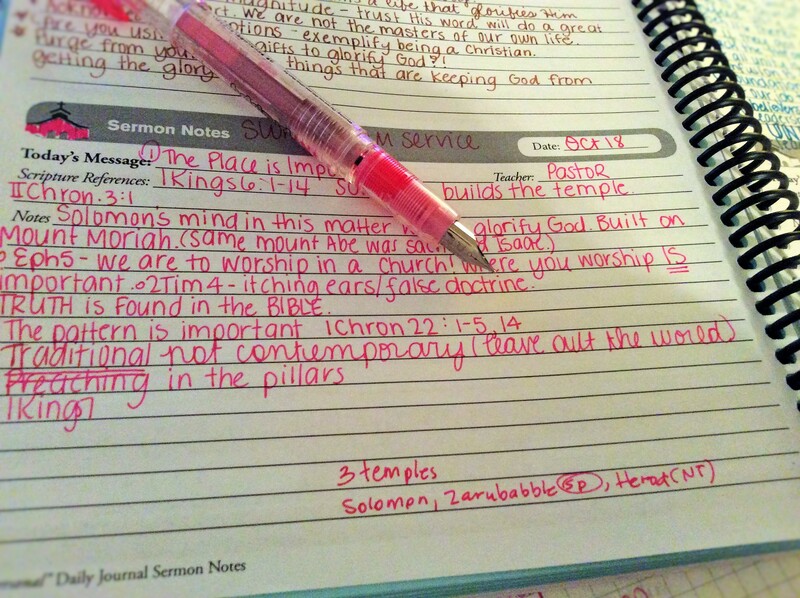 I really enjoy these gels and use them a lot when I mark in my bible(s). The tips are narrow and great for tiny print! Accu-Gel Bible-Hi-Glider gel highlighters are what are on my rotation right now. 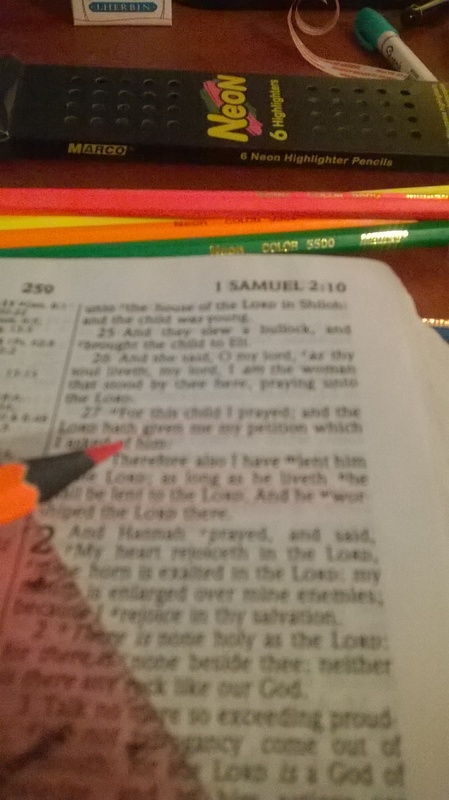 I am using the green for studying in my MEV bible at the moment. One, because it’s a small, thin highlighter, and two, because it’s new. I literally bought these last week. In fact, I’ve been using the green so much I had to go back to Mardel yesterday and buy another one because I was down to the nub. 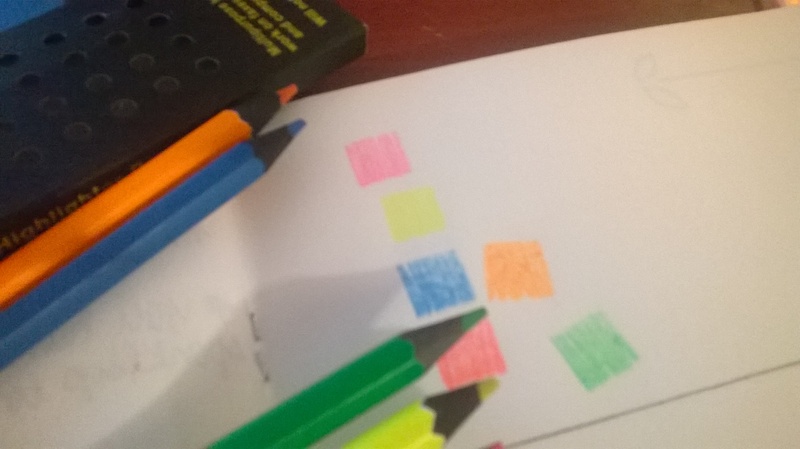 The only drawback of these highlighters is that if you run your finger across the gel after highlighting something it feels wet and like it’s going to make the pages stick together. It doesn’t. And it doesn’t smear. It just feels that way when you touch it. 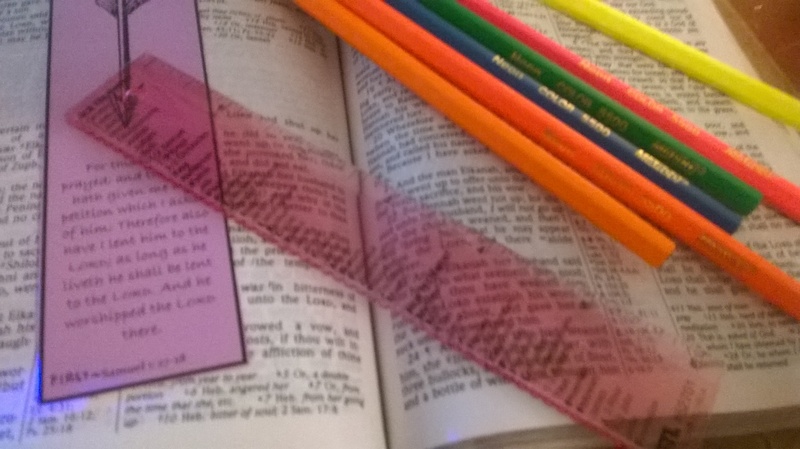 However, the gel dries lighter than when it’s first applied, so I recommend marking over something a few times, especially if you are using these gels for bible highlighting. I don’t know where the color goes, because it doesn’t ghost through the paper or anything. It just seems to evaporate a bit. (Weird, right?) These tested the same as the others. I used them right after writing with several different inks and there was only smearing with the Pilot Down Force ballpoint pen. And it’s not a lot, just barely noticeable, but still. It’s smudging and if you’re OCD like me, it nags. And last, but not least, is the Sharpie Gel highlighter. This one is a little different because of its shape. It’s not round or square– it’s slightly oval– like a carpenter’s pencil. Which makes it great for highlighting small print! BUT, it does smear a bit. Mostly the Onyx and the Pilot Down Force, but glided smoothly over the fountain pen and gel Sarasa 3. The tip on the Sharpie is somewhat dry, but when you put it to paper you can’t tell and it doesn’t affect it’s purpose. Over all, the Sharpie Gel is great! I guess I don’t use it because it’s a bit bulky and misshapen. So, to answer my question, IS there an ultimate gel highlighter?? And the answer is… NO. For me, it boils down to preference and purpose. Overall I have yet to use a junky gel highlighter. Nothing smeared to the point I wouldn’t use it and they don’t bleed or stick pages together. So it just comes down to asking: what am I using this for and will it help me get the job done? Don’t forget to visit these awesome shops (that did not give me money or stuff to recommend to you– I just really like these shops): Mardel, JetPens.com, and Office Depot (for the Sharpie Gel highlighters). There are lots (and lots!) of great study materials out there. Just go to JetPens.com and see what I mean– LOTS! 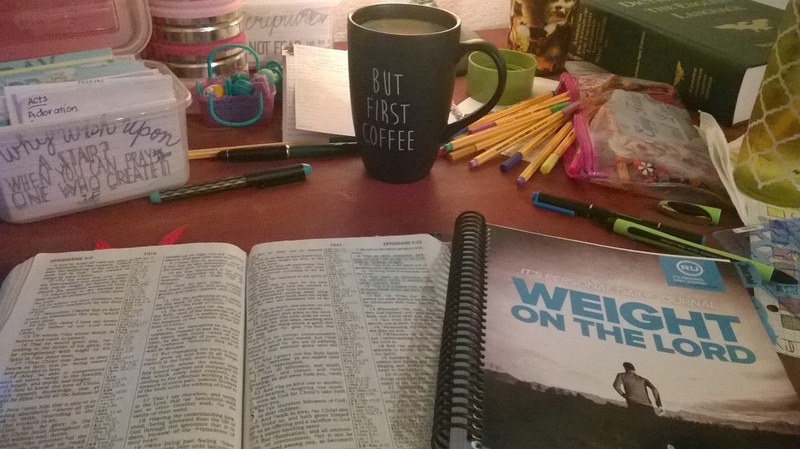 But when I read and study my bible there are only a few things that have really made it to my “must have with me all the time when I study” list. And these are it. My bare necessities for bible study. Micron Pigma pens. I bought this one in a five pack priced at $19.99, but I used a 40% off coupon. JetPens sells a five pack for roughly $13.50. The set I bought had one “01” tip and five “05” tips. The number references the size of the tip. 01 is .25mm and 05 is .45mm. 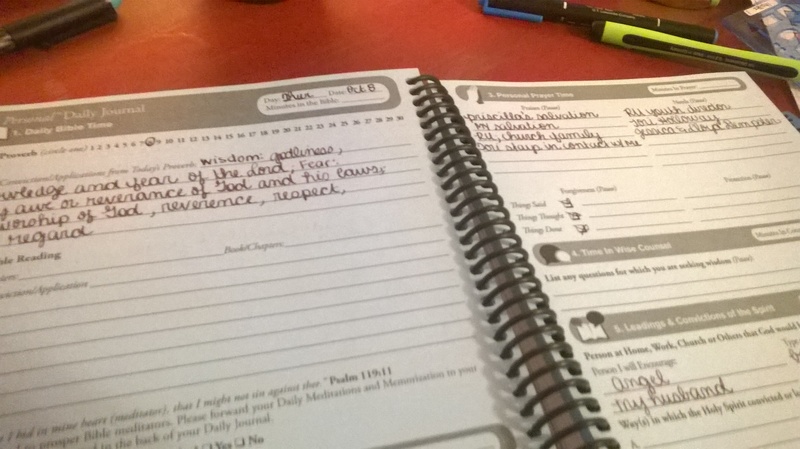 They are great for note taking and underlining in your bible (and on other books and documents). They don’t bleed and the ink is archival. It’s also waterproof and fade proof. Here you can see the difference in the size of the pen tips. The tip on the left is the 01 and the one on the right is the 05. HUGE difference, right?! And it makes a huge difference in one’s note taking as well! I also use dry highlighters when I study my bible. Not only are dry highlighters excellent for using on onionskin paper, they’re great for highlighting in just about every other book you can imagine. They don’t bleed, smear, feather, smudge, or dry out. They work wonders over wet ink!! I bought these on JetPens.com as well. I did buy them separately, but JetPens offers them in packs. And of course, a bookmark. This is actually a card that I am using as a bookmark. It’s made of super heavy cardstock. Plus, it’s Green Lantern. Inside I wrote some KJV study helps. The “thee, thy, thou’s” confuse me sometimes, so I wrote them down for easy reference. 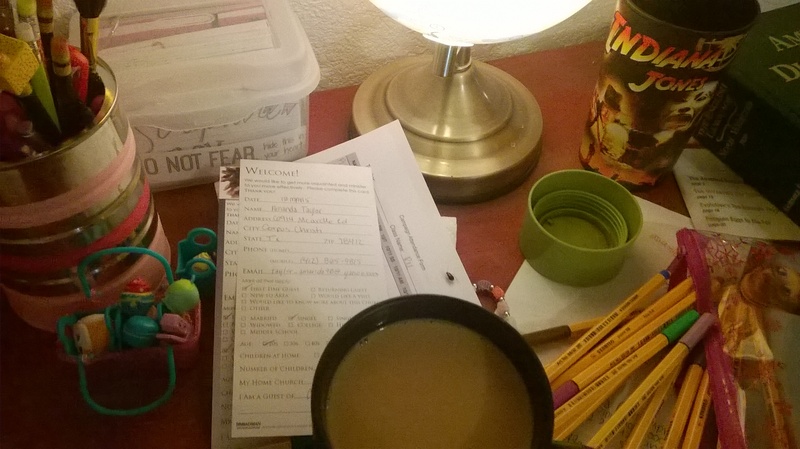 Tonight I was finally able to really put pen to paper in a real world setting: notes! I used a Nemosine Singularity Demonstrator (clear, M nib) and a Platinum Preppy (03, F) to scrib at both services today. It’s been a while since I have had the opportunity to attend a service (I’m usually somewhere else, like the nursery, or teaching a Sunday school class, etc.). I jump at the opportunity to put miles on my pens and today was prime! 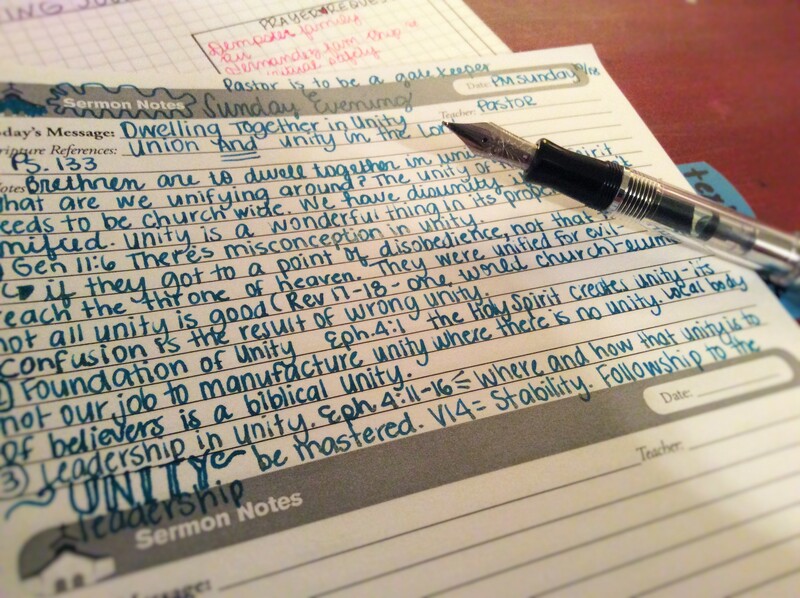 I actually got to use the pens in three services since my husband had to serve in the early service. I tagged along. Of course it’s filled with Emerald of Chivor, but that might just change because my TWSBI Eco and J Herbin Moon Dust Purple arrive this week from JetPens! Talk about smooth! This pen is one of my favorites for when I need to really get down to work. The paper I used for notes wasn’t half bad, either. It’s a thick notecard type paper and there’s hardly any feathering. You almost have to put the tip of your nose to the paper to see it and even then it’s hardly noticeable. My Platinum Preppy got some exercise today. If you’ve never tried a Platinum Preppy, I highly suggest it. It completely changed my mind about disposable fountain pens! I used my vintage Pelikan 120 to write some memorization out. 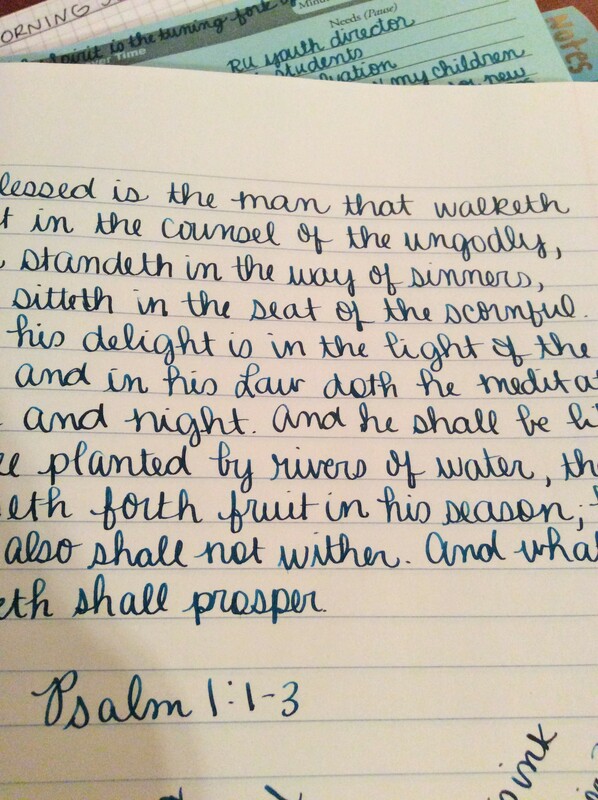 I have to write to memorize and what better way to do that than with some wet ink and a nib?? 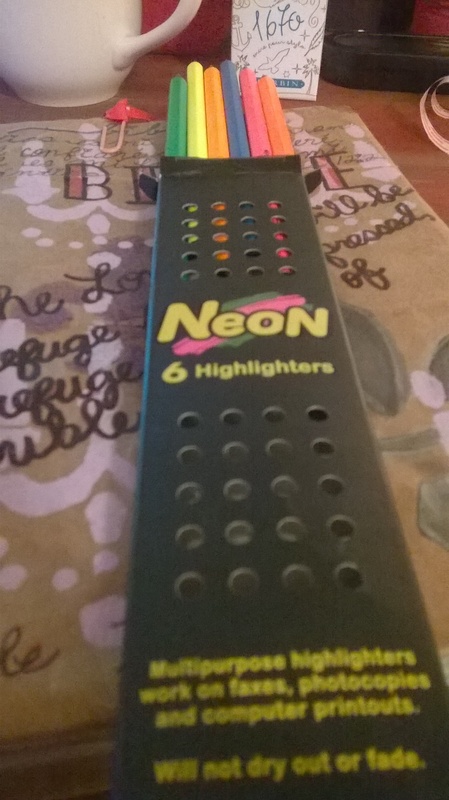 Last month while I was visiting my dad for Labor Day, I picked up some neon highlighter pencils at Jerry’s Artarama in Austin, Texas. I’ve been wanting to try these for quite some time and the price was perfect: about five bucks for a set of six. JetPens sells them, too, for roughly the same price. 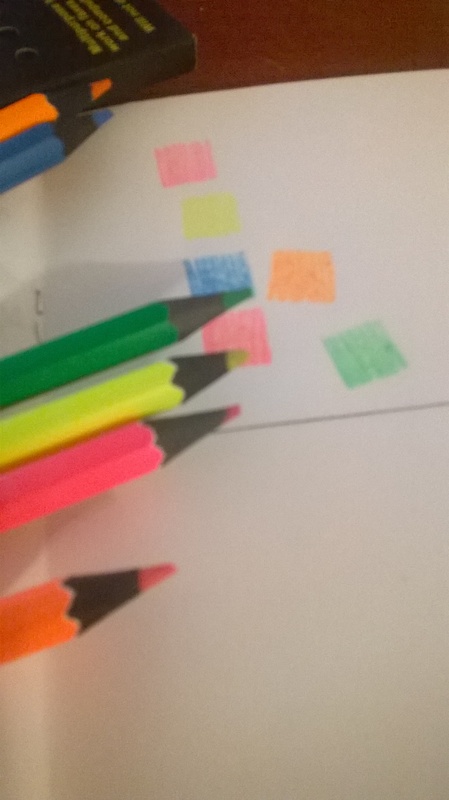 I bought the traditional 6 highlighter colors : Yellow, Orange, Pink, Red, Blue, Green. 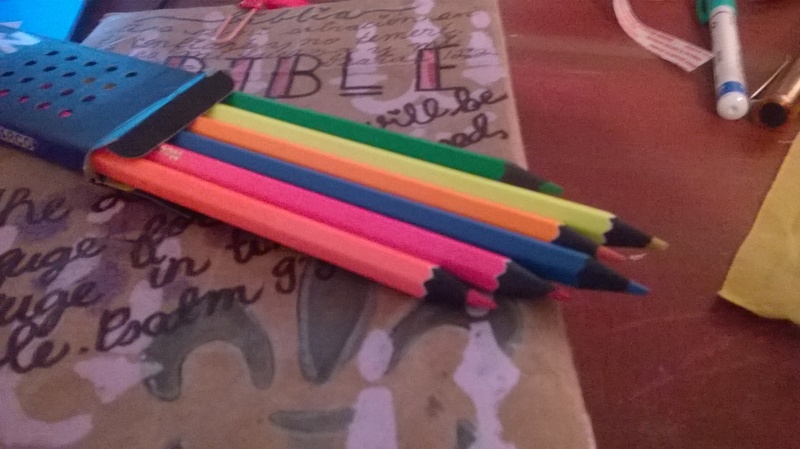 These pencils came in stylish blackwood! I uses these for underlining in my Bible. I also use a small clear ruler I picked up at Mardel. One side is smooth and the other is bumpy. I use the bumpy side for underlining God’s promises, or every time God says “I will” in the book of Psalms, etc. My husband has the good camera today, so it’s a bit blurry. You can sort of make out the orange color. In real life the color is fairly vibrant. Depending on the paper, these pencils can get pretty intense. This Bible has classic onion skin paper, so it didn’t come out very saturated. Overall, highlighter pencils are a good alternative to classical highlighting. Enjoy! I’m studying prayer and dissecting it. 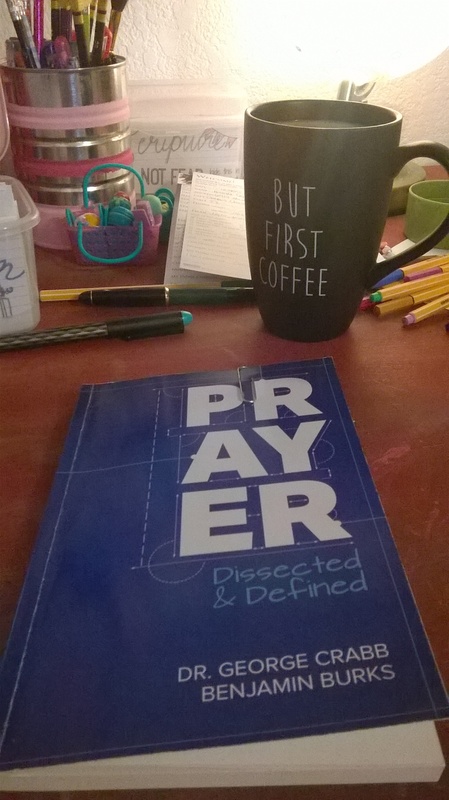 This book, written by Benjamin Burks and Dr. George Crabb, is fantastic for simple understanding of what it is and what it means to pray. I bought this on Sunday when Mr Burks preached at our church for the Reformers Unanimous opening. My prayer box. I don’t pray in my head extemporaneously. My mind wanders too much for that. 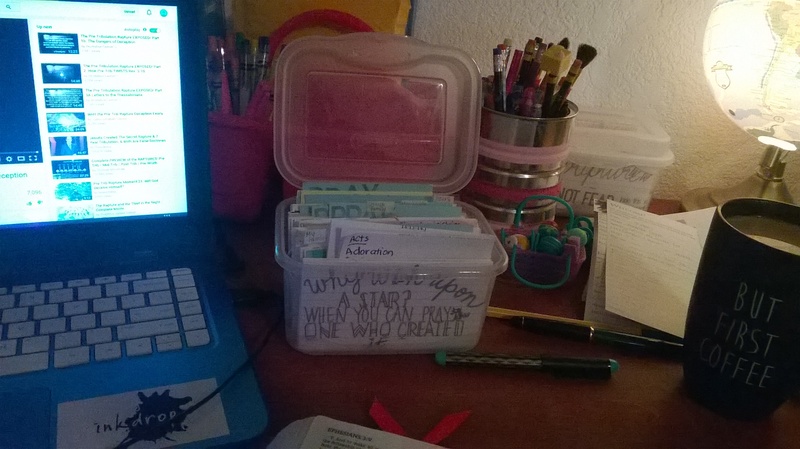 So, I write my prayers on index cards and file them by subject. 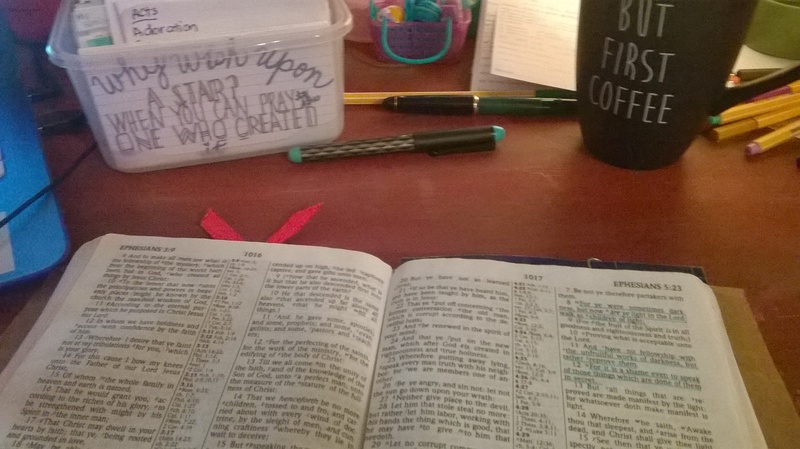 Each morning (and I’m trying for evenings) I go through my box and pray my prayers and add on accordingly. LOTS of water. Always. I’m trying to be healthier. 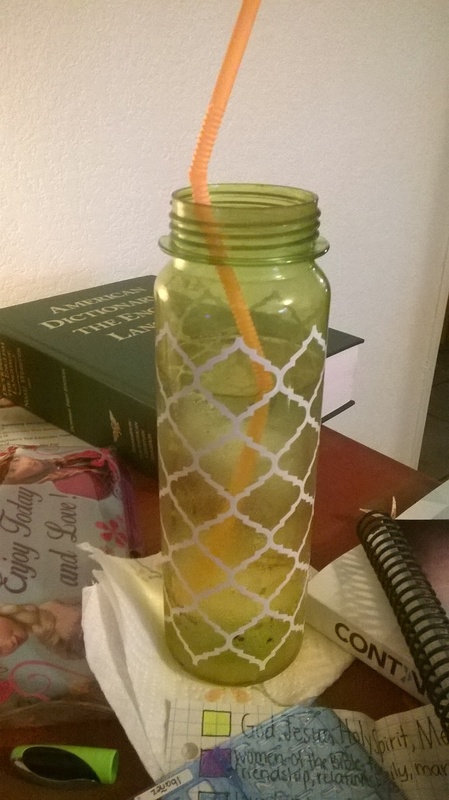 I try to drink four to five of these every day. I read my bible. It’s a KJV lay flat bible. This is the one that I have been using since I was saved. It’s taken a beating, but it’s got a lot of sentimental value. I usually read this one in the mornings and my Rock of Ages at night. I read a chapter in Proverbs every day and I am making a bigger effort to read other books, too. And after reading Proverbs, I record it in my Daily Journal for Reformers Unanimous and also fill out prayer, needs, protections, and praises. 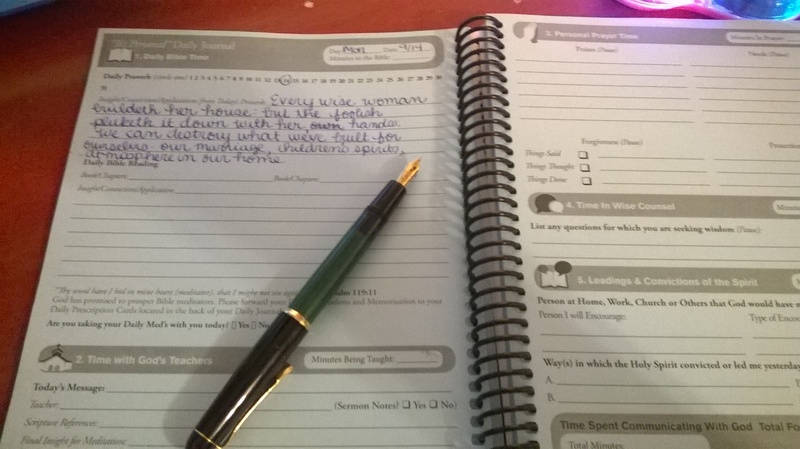 I really, really enjoy this journal. I also do my personal discipleship meditations. 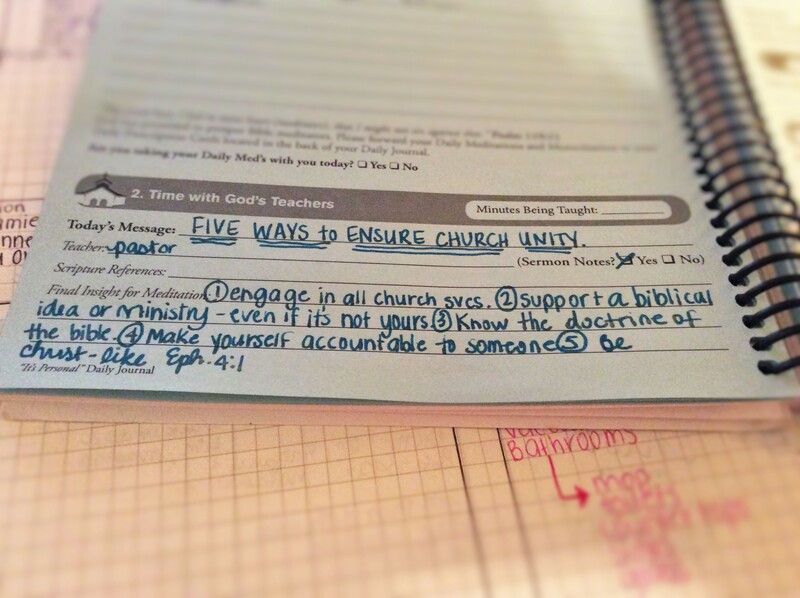 I am working with a new believer in Christ, so I, too, have to complete the course along side of her. 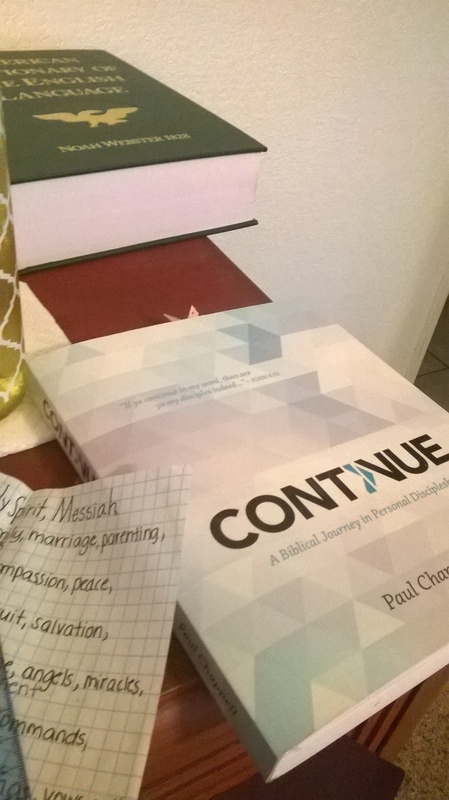 I HIGHLY recommend “Continue” by Paul Chappell. For new believers and seasoned Christians alike! Any my companion: Noah Webster’s 1828 Dictionary. I use this daily during my bible studies to dissect and define words to help me gain a better understanding. Even words that I think I know have a completely different context in scripture. This weekend was the Reformers Unanimous kickoff weekend at our church. We had Bro Benjamin Burks (National RU Director) come in and spend the weekend with us. He trained our church members, and more importantly (to me, anyways, I had already been to Rockford for training…) he preached on Sunday. I woke up Monday feeling physically exhausted from a long weekend, but I felt spiritually renewed! So many truths were revealed on Sunday that I’m going to have a lot of studying to do from here to Christmas! He set up a book table (I can’t tell you how thankful I am that he did that. 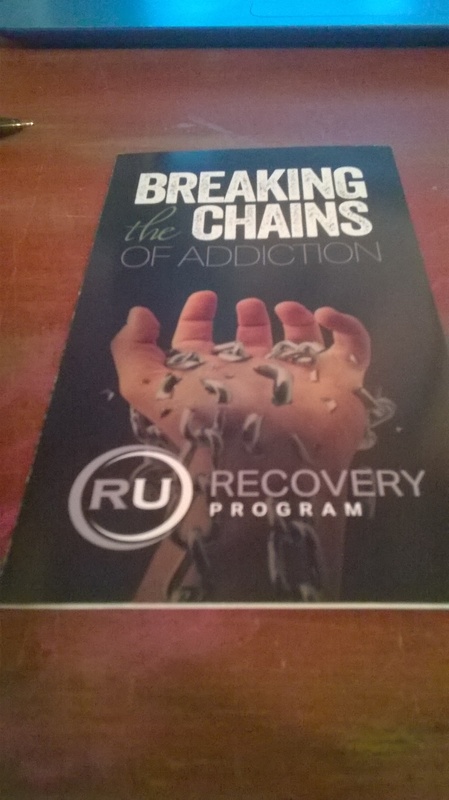 Everyone that attended Sunday services left with something!) and I picked up a few books that I have been wanting to read. 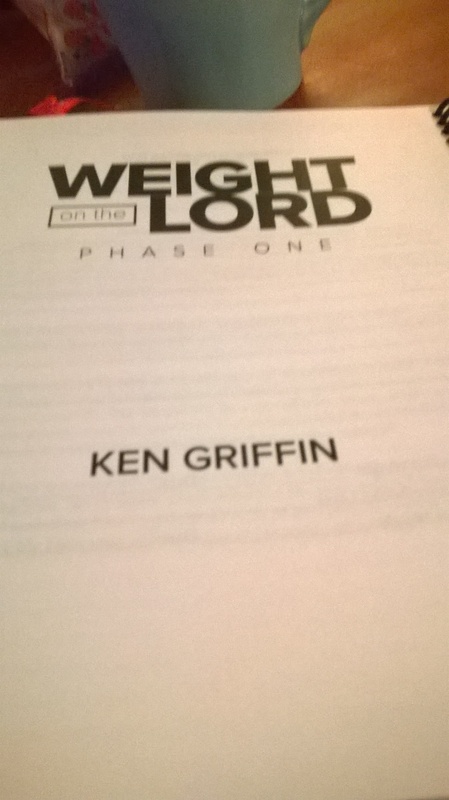 The numero uno is “Weight on the Lord”. It’s designed to help the participant overcome the stronghold of FOOD! 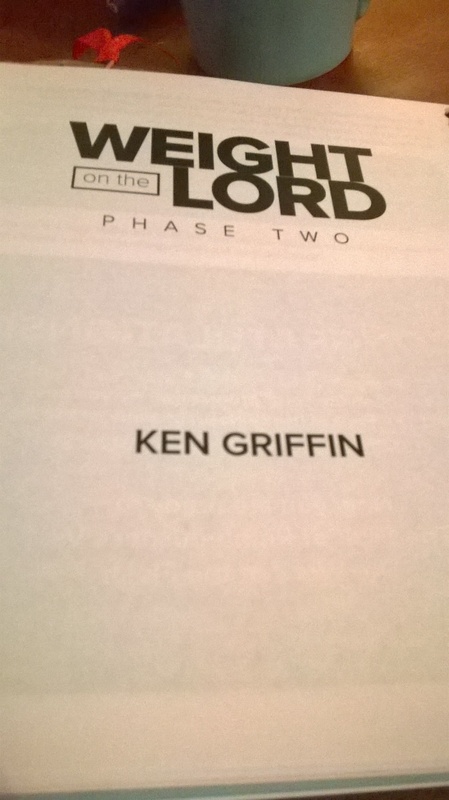 I just started this journey and I can’t wait to see what the Lord reveals to me! It’s not gimmicky, it’s not a “when all other weightloss programs have failed” program. 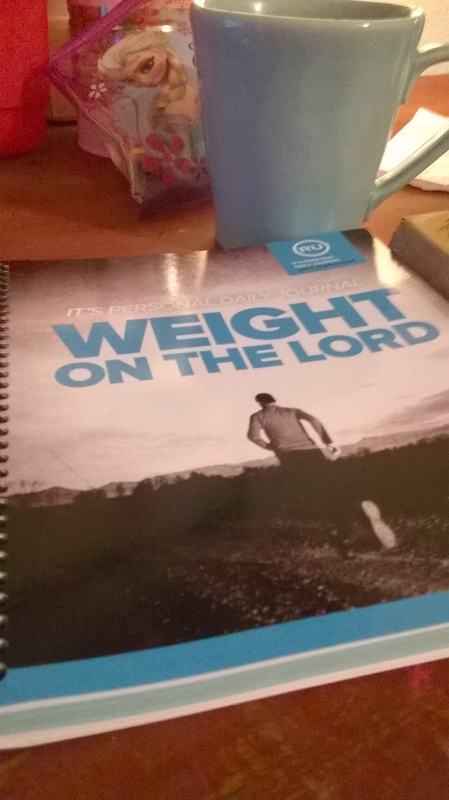 It’s bible study, meditation, understanding the sinful nature of our hearts, and bringing that to the Lord to gain victory over emotional eating, gluttony, and over indulgence. I can’t wait!! I’m doing a challenge or two per week. It’s set up into two phases. Phase one. And phase two. Each phase has 16 challenges. I am going to do roughly 2 challenges per week. Maybe on some weeks (the challenges get harder as the program progresses) I’ll only do one challenge. I’m shooting for 12 weeks total. I’m going to guess that the challenges that require exercise are going to be my once per week challenges, lol. 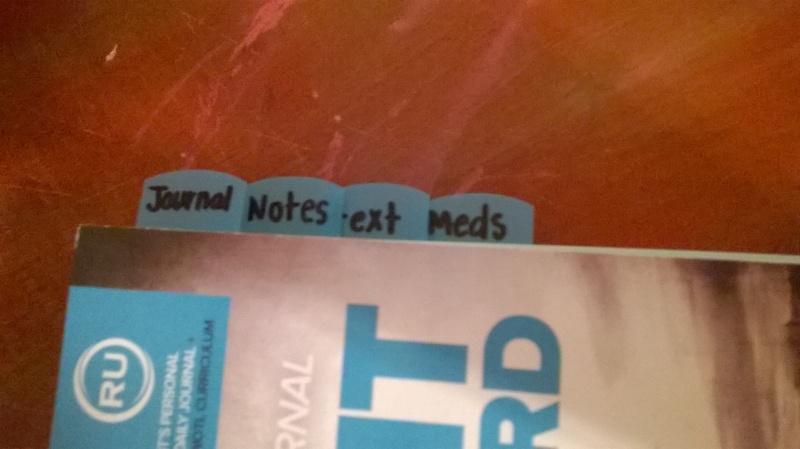 Since the daily journal and the WotL curriculum is bound in the same book, I used some tabs to divide my journal. It was hard to find the text. For some reason it gets lost in between the other sections. Now I have easy navigation. I can’t wait to keep you updated on my progress. I don’t have a goal weight or a goal amount of weight I want to lose. I mostly want to develop healthier habits. I’ve been in the process of learning Spanish for the last few weeks. I bought a Spanish workbook and it came with a CDROM for audio and extra practice. It’s tourist Spanish, but I’m mostly using it for sentence structure. Why learn Spanish, you ask? Well, I really want to be able to reach out to a HUGE demographic where we live with our ministry. We currently live in the gulf coast region of South Texas, about an hour and a half from the Mexican border. 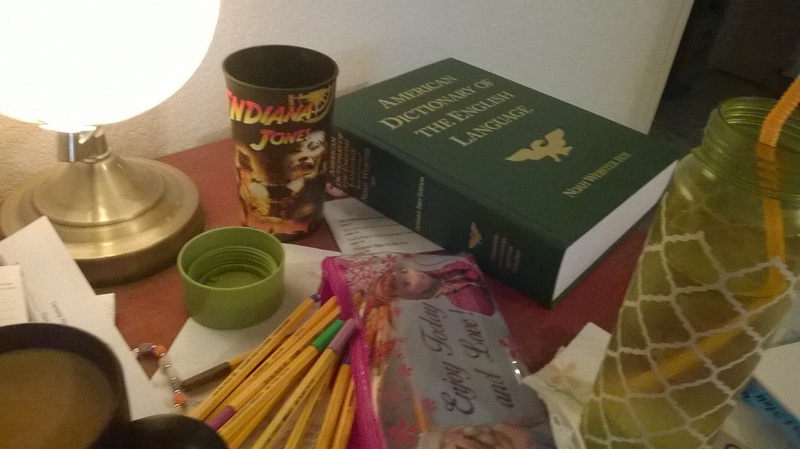 My husband and his family are fluent Spanish speakers, and I can speak a whole lotta German. Spanish? Not so much. 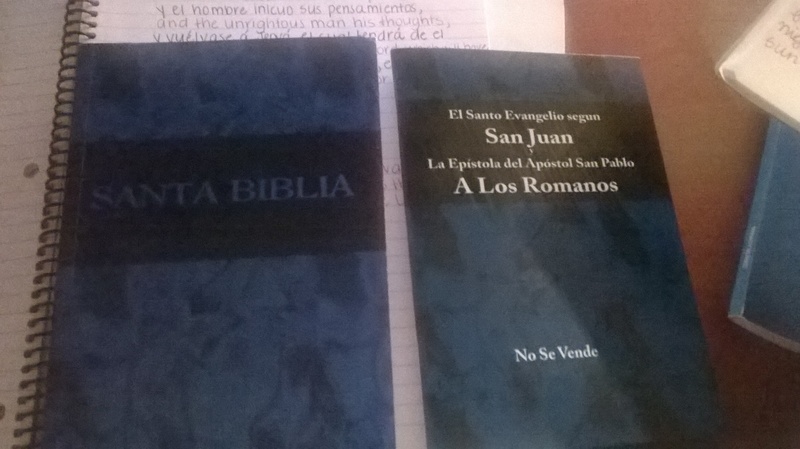 I think that by learning Spanish and bible Spanish we can reach people for Christ more than ever!! Reformers Unanimous has Spanish materials, so it’s just me not knowing how to speak or understand it that is keeping us from becoming a bilingual ministry. 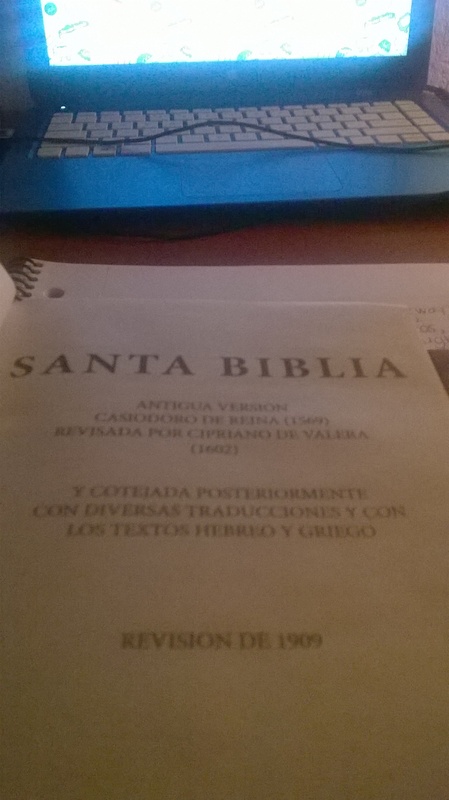 I am using a Reina Valera Santa Biblia revision de 1909. It’s the KJV equivalent. I am currently memorizing Isaiah 55:7 for one of the Reformers Unanimous challenges. 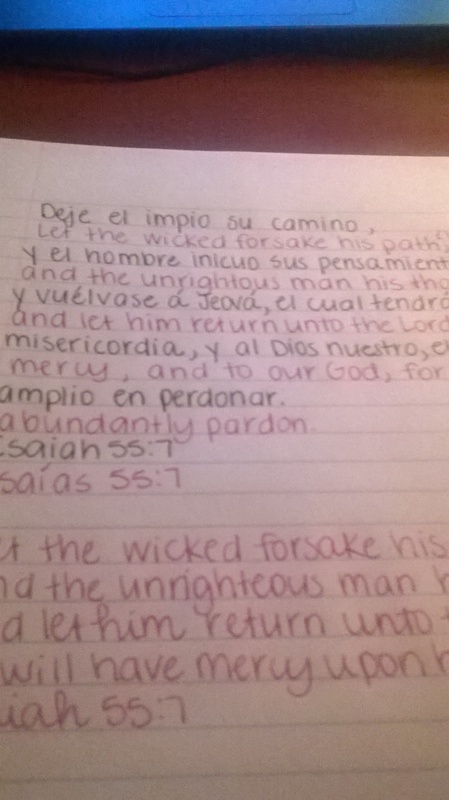 I have the English verse down, but am still working on the Spanish translation. My goal is to memorize all the RU verses in both English and Spanish!! 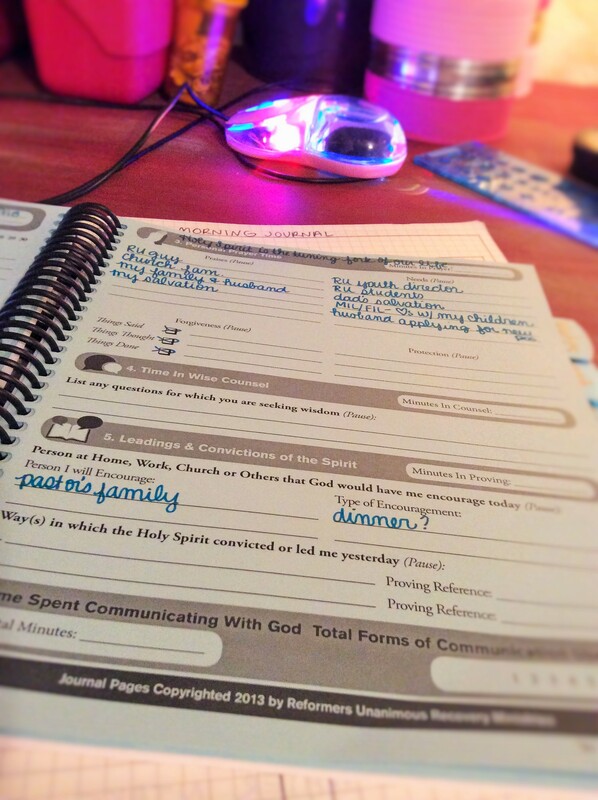 I am in LOVE with the Reformers Unanimous Daily Journal. 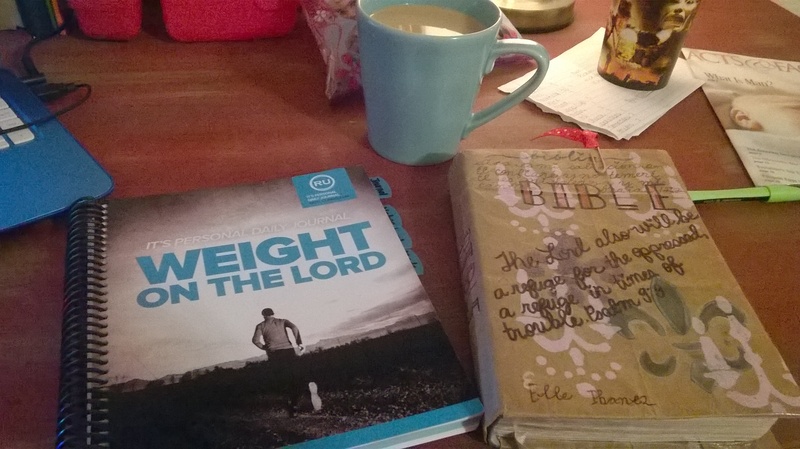 It’s the perfect book to allow me to reflect, take note, and document my time with God. It’s user friendly, the paper is decent enough for my wet ink instruments, and it’s small enough to throw in my purse. It really is a blessing to use in concordance to attending the Friday night RU meetings. 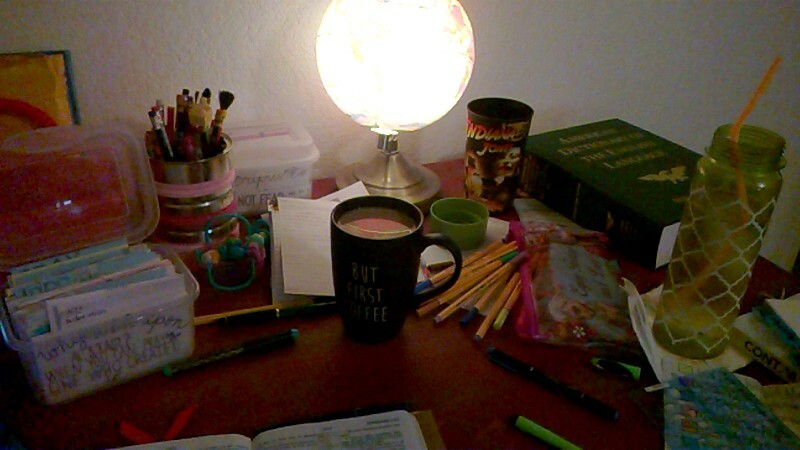 Today I read Proverbs 14… and of course, I jotted down something that I took away from it. I love reading a chapter in Proverbs every day. It’s like waking up every morning to an “ah-hah!” moment! They just make sense! 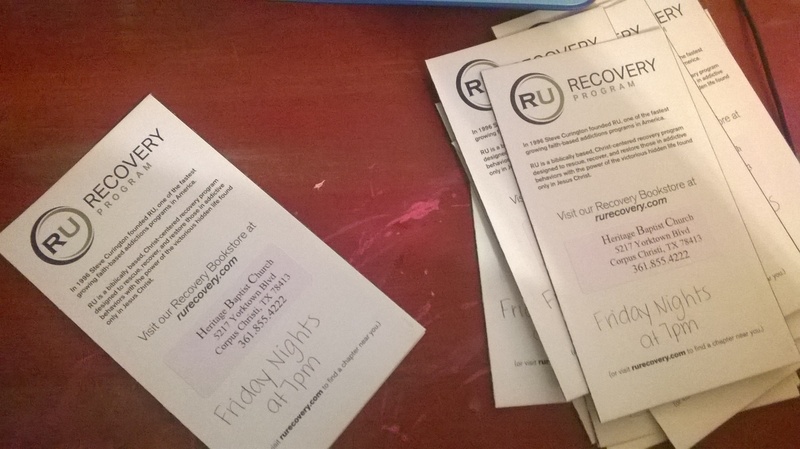 RU tracts– labeled and ready to go! 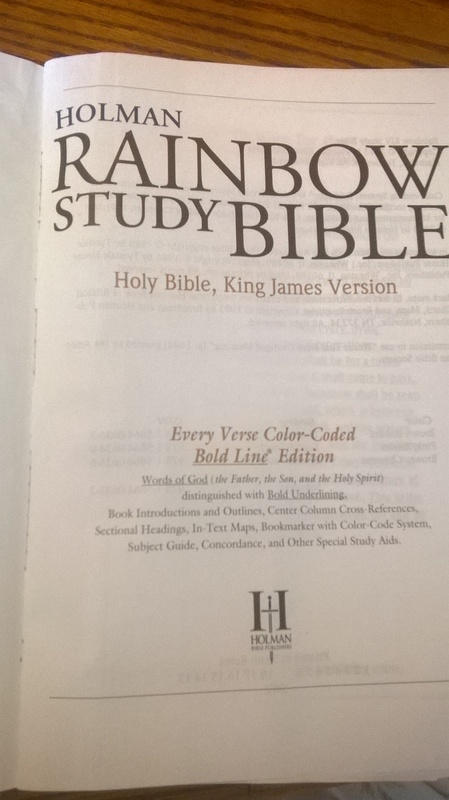 My trusty KJV Rainbow Bible. Perfect for morning devotions! I wanted to share with y’all a bible I’m using for some of my studies. 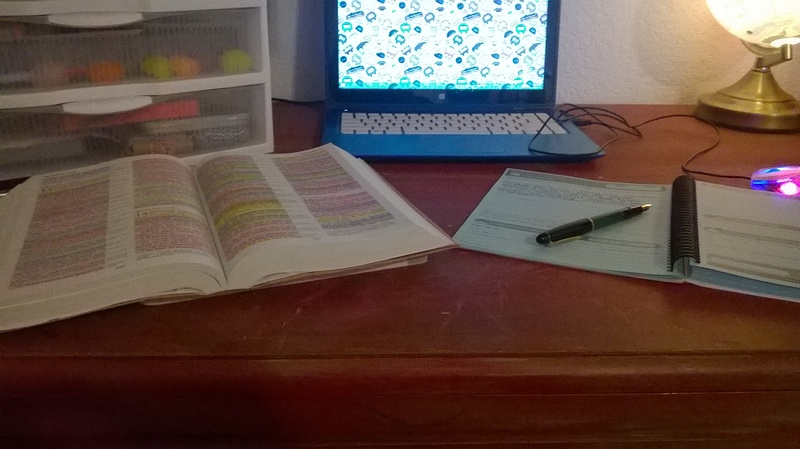 It’s the Holman Rainbow Study Bible and it’s already color coded and highlighted! It’s been a huge blessing in my studies. 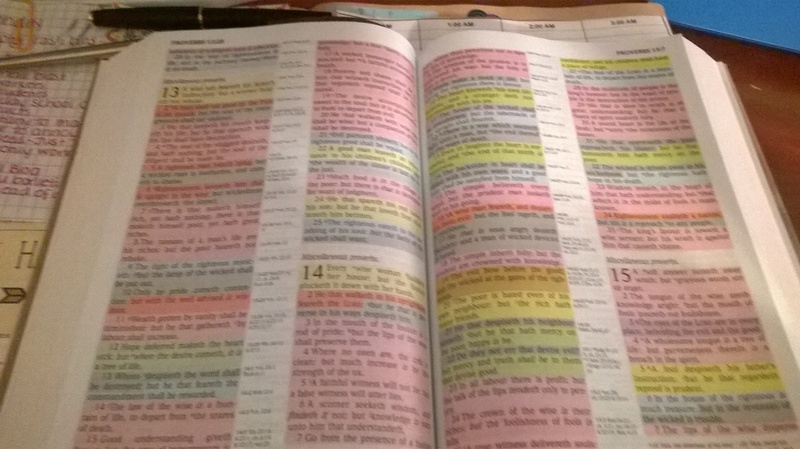 Every single verse is color coded. 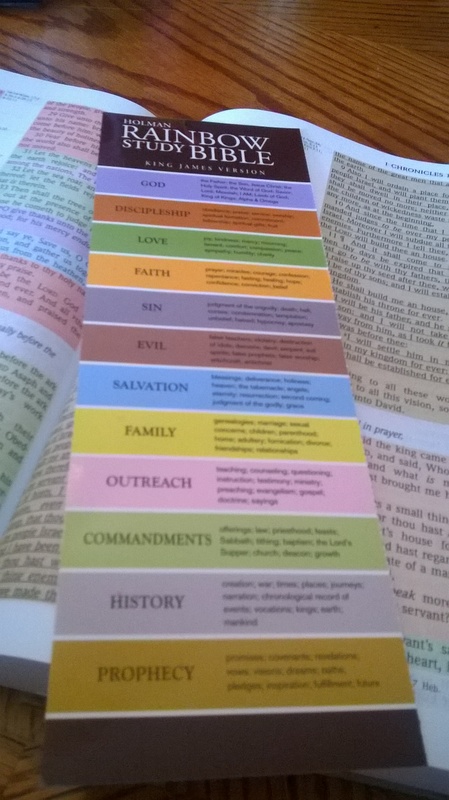 It came with a handy bookmark with each color defined. It has each main category and its subcategories. 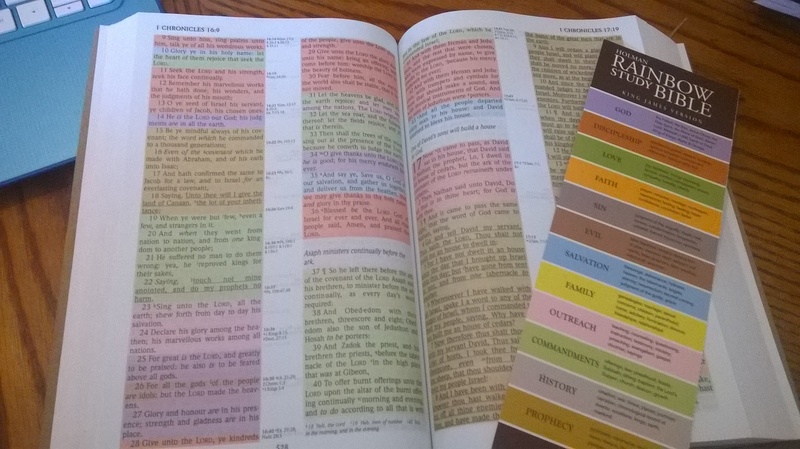 Even though I am a huge proponent of highlighting one’s bible themselves, using this color coded bible really has shed some light on subjects I don’t think I would have understood otherwise. Also, some of the pre highlighted topics are under categories that I wouldn’t have put there myself. It’s an interesting option in bible study.